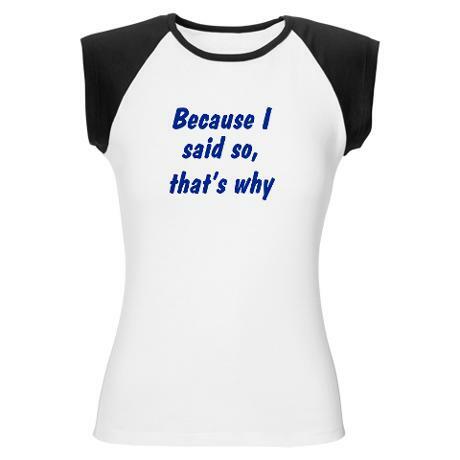 God's Perfect Timing: The Lost Art of "Because I Said So"
On this Father's Day weekend, I found it fitting to reflect on one of my own father's most favorite sayings: Because I said so! He had a shirt with this saying on it, so that when he got tired of actually saying those words, he could just point to his chest. Perhaps many of you grew up with parents who also loved that phrase. I, for one, promised myself (at the wise age of fifteen or sixteen) that when I grew up and had a family of my own, I would never use that phrase. Many of you may have made that same promise. I swore that I would give my children explanations and reasons, answer their persistent questioning and demands with a calm and patient demeanor, and seek to help them understand why they can or cannot do whatever they are asking to do, have whatever they are asking to have, or go wherever the are appealing to go. That was my promise and I stuck to it for a good while...nearly my first years as a parent. Specifically, when the only children in our home were preschoolers, when there was only two of them, when their questions were primarily based on curiosity and wanting to explore their world, and when the only material items they asked for could be purchased at the Dollar Store. We added a tween, Larry continued to ask at least five thousand questions per day, Moe entered a horribly whiny, three-year-old phase, Sassy would repeat everything Moe said or asked, in his same whiny tone, and neighborhood kids flocked to our home to play, bringing with them their own barrage of questions. I was getting hit with questions from every angle. Persistent questions, nagging questions, questions still based on curiosity, questions as to my reasoning on why we cannot have ice cream every night, questions from the neighborhood kids as to why they can't play football in the same space the preschoolers are using to scoot around, questions as to why they can or cannot have/do/go whatever might happen to be on their minds at the moment. Then one day, I remembered some magic words. I know I promised I would not use them, but after all we are not going to have the tail wagging the dog on my watch. Hey kids...check this out: BECAUSE I SAID SO...THAT'S WHY! Do you understand? No, OK...we can try it again. Go ahead ask for something. You want an iPod touch? No can do. You know why? Because I said so! Now, to be certain, we do discuss our reasoning for everything from the physical world we live in to our eternal Christian belief system. We discuss and learn and explore all day long. I love learning and growing and building critical thinking skills. Answering questions from my children brings me much joy and pleasure. It it one of the most rewarding parts of parenting, in my opinion. However, sometimes the answer is just going to be the resurrected age-old adage: because I said so. No additional reasoning, nothing to explain. Plain and simple. I actually put this phrase to use today, you know...to honor my father on Father's Day. The younger kids were playing on our new wet/dry bounce house outside. They jumped and climbed and slid and splashed for hours. When they were finished playing, we turned the castle on its side so it could dry off before being deflated and put away. While it was on its side, the older kids decided to use it for pitching practice and a soccer goal. Every time they threw or kicked a ball, the castle would inch back, eventually landing on our concrete driveway. I was observing their play from our upstairs window while doing laundry. Because our concrete driveway is a rough surface and the bounce house was not cheap, I opened the window and told them not to play there, that the bounce house was drying off and to leave it alone. Three boys were trying to give me every reason under the sun as to why they should still play there and why the bounce house would be OK. Hey boys...guess what? Don't play there. Got it? Do you know why? BECAUSE I SAID SO. And off they went. Hopped on their bikes and rode back to the pool. Sometimes, the cause of my stress and frustration is that I try to give too many reasons or explanations as to why things are as they are. With five children, I simply cannot do this without forsaking my sanity. I would be fielding questions all day long. It seems that many parents today have ended up on the opposite end of the spectrum from that of our parents. Not wanting to be the "Because I said so" types, we try to explain and reason all of our actions. Sometimes there is nothing to explain or reason and I need my children to understand that I do want to help them grow and explore, but they need to respect the role of the parent in the home and accept their position as child. As such, there is a time and place to discuss our rules and there is a time and place to simply comply with them. If they are confused as to what time it might be, I tell them to default to comply. Finally, Scripture is pretty clear in the area of relations between children and parents. Children are to obey and honor their parents. Parents are not to provoke their children to anger (Ephesians 6:1-4). As you can see, there is responsibility on both the part of the parent and child. If I were only to go around saying "Because I say so" all day long, I would not be fulfilling my duty to God as a mother. However, my children need to be raised to understand that God created an orderly universe, and as such, we create our lives in an orderly way. With five children, and all of the intricacies that come with older-child international adoption, our home would be complete chaos without honoring certain roles and functions. Personally, I have found it extremely beneficial in our marriage for my husband and I to remind each other regularly that we each need to be submitting to God's will. By doing so, it takes stress of our marriage relationship and instead points our prayers, energy, and focus toward God. God, in turn, helps us reorganize ourselves, our marriage and home, and relationships with our children. When our relationship with God is right, our marriage relationship is strong, and we are both better parents for it. However, the primary relationship will always be between each individual and our eternal God and all other relationships grow from there. With that being said, never be afraid to dust off and bring back to life a good 'ole "Because I said so" once in a while. It kinda feels good to say it and if nothing else, buys you are little more time to think of a more articulate way to handle whatever situation you may find yourself in. That's so ironic!! I did the "because i said so" for the first time this past week!! I made it about 4 years, it does make life a bit easier! !